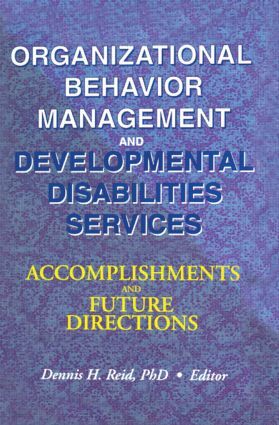 Organizational Behavior Management and Developmental Disabilities Services: Accomplishments and Future Directions examines the advances of Organizational Behavior Management (OBM) in human service agencies for individuals with developmental disabilities. Management researchers, working managers, and supervisors will learn strategies for effectively managing the day-to-day work performance of personnel and receive ideas for further enhancement of quality supports in human service agencies. Discussing the history of OBM and future research needs, Organizational Behavior Management and Developmental Disabilities Services offers the information you need to boost staff morale, make your workers more effective, and improve services to clients. Organizational Behavior Management and Developmental Disabilities Services offers numerous reviews of case studies, providing you with current research and past trends that indicate the successes and failures of OBM and how efficient methods can be used in different areas of human services. Containing graphs and concise charts that summarize research findings, Organizational Behavior Management and Developmental Disabilities Services will help you and your staff implement OBM methods that will improve your effectiveness and better serve clients with developmental disabilities.